Supported by the Projects Abroad Microfinance Project, a small community soap factory in Ghana produced and sold their first batch of locally made soaps last week. 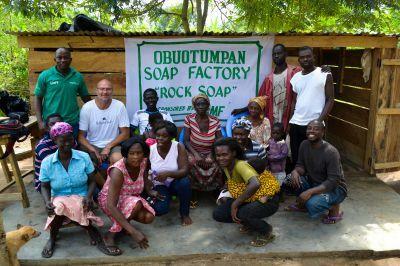 The Obuotumpan Soap Factory in Koforidua was established by the community through the support and direction of the Microfinance Project’s volunteers and staff. Some members of the community were also trained by a local soap expert. The soap, which is branded ‘Rock Soap’, is made from eco-friendly ingredients which can be sourced locally. The name ‘Rock’ is the English translation of the first part of the village’s name – ‘obuo’. The community collectively owns the factory and they contribute their time and energy in producing and marketing the soap both internally and in surrounding villages and markets. “The energy and commitment demonstrated by the community is encouraging,” remarked Peter Hoekstra, a volunteer from The Netherlands. Along with Peter, other Microfinance volunteers worked to ensure that the factory is established and run in a profitable manner. They have developed a relevant accounting system for the community for recording their spending and income; and have provided training in book-keeping and business management. Projects Abroad encourages volunteers working in Ghana to buy the locally produced soap for their families and friends back home to support the growth and development of the factory. The Projects Abroad Microfinance Project believes that initiatives such as this will empower the people and help support a sustainable future for communities. Find out more about the Microfinance Project in Ghana.